The article written by Irene Thomas, who visited the destination on a FAM trip sponsored by the Riviera Nayarit CVB, is circulating throughout five Canadian provinces along the border of the United States, extending from the Pacific to the Atlantic and delivering thousands of impressions along the way. 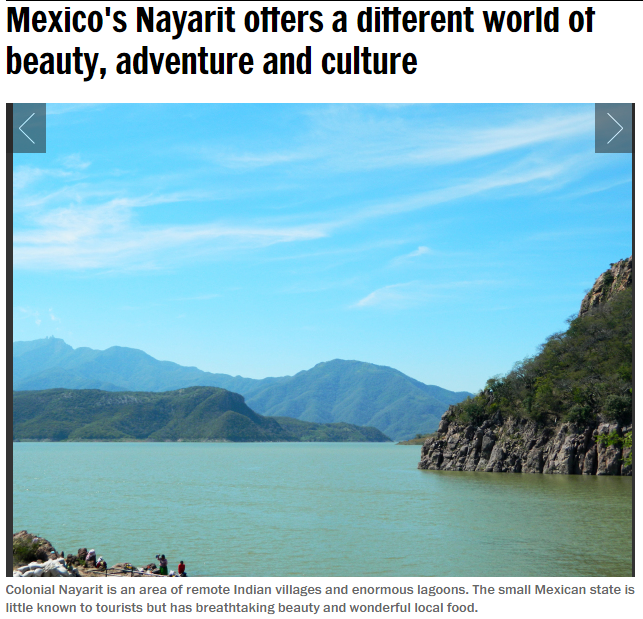 Freelance journalist Irene Thomas published the article, “Know Nayarit,” after her FAM trip to the destination, sponsored by the Riviera Nayarit Convention and Visitors Bureau (CVB). Since then, it has been popping up in Canadian newspapers from one end of the country to the other. The public relations efforts of the Riviera Nayarit CVB seek to position the destination in the minds of consumers, an objective that was amply reached at the close of 2014, when from October through December that article was posted in different media in five Canadian provinces that border the United States. If we go begin the list moving east to west, one of the most important media that published the article was The Vancouver Sun in the province of British Colombia, located on the Pacific Coast. Following the map we found the article in the Edmonton Journal and the Calgary Herald in the province of Alberta. In Regina, it was published in the Leader Post, and in Saskatoon we found it in The Star Phoenix within the province of Saskatchewan. The Riviera Nayarit’s attractions also circulated in the Windsor Star in the province of Ontario. Finally, we reached the Atlantic in the province of Quebec, where the destination was put on display in the cities of Ottawa and Montreal in the Ottawa Citizen and the Montreal Gazette, respectively. There’s no need to indicate the circulation numbers of each media, when a single FAM trip for one journalist and her photographer generated an article that was published in five of the most important Canadian provinces that send tourists towards the Riviera Nayarit. Other regional attractions besides the Riviera Nayarit were also included in the article, including Las Lagunas Encantadas, the Sierra del Nayar and Colonial Nayarit, sister brands of the destination that are also being promoted by the Government of the State of Nayarit.